An unidentified group of people have detonated a bomb in the house of UML chairman K.P Oli at Damak Municipality-5. Another bomb has been detonated in the house of NC district chairperson Uddhav Thapa on November 25. 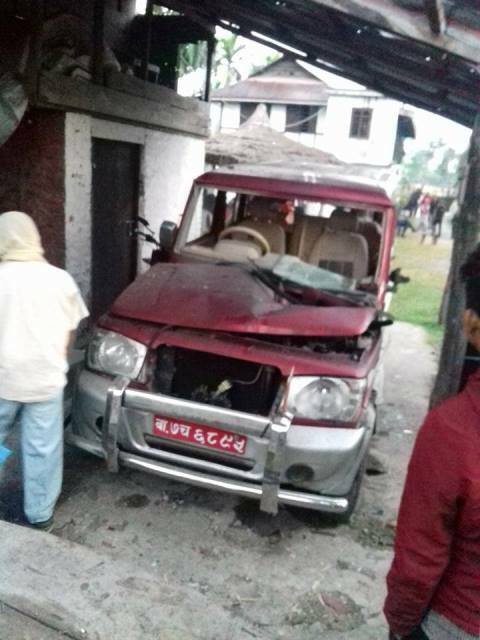 A bomb was detonated in front door of the house of chairman Oli in the morning of November 25 according to DSP Deepak Giri of Area Police Office. Another bomb which did not exploded was diffused by the team of Nepal army. UML chairperson K.P Oli is FPTP candidate from constituency number 5, Jhapa. Similarly another bomb was detonated in the house compound of District Chairperson Uddhav Thapa of Nepali Congress at Arjundhara Municipality-7. In an explosion, parked vehicle was damaged according to DSP Krishna Prasad Koirala of DPO. The incident is under investigation according to the police.